Norangsfjorden is similarly scenic as nearby Geirangerfjord, but smaller and not nearly as busy due to a 42-ft (13m) bar that prevents larger ships from reaching the head. 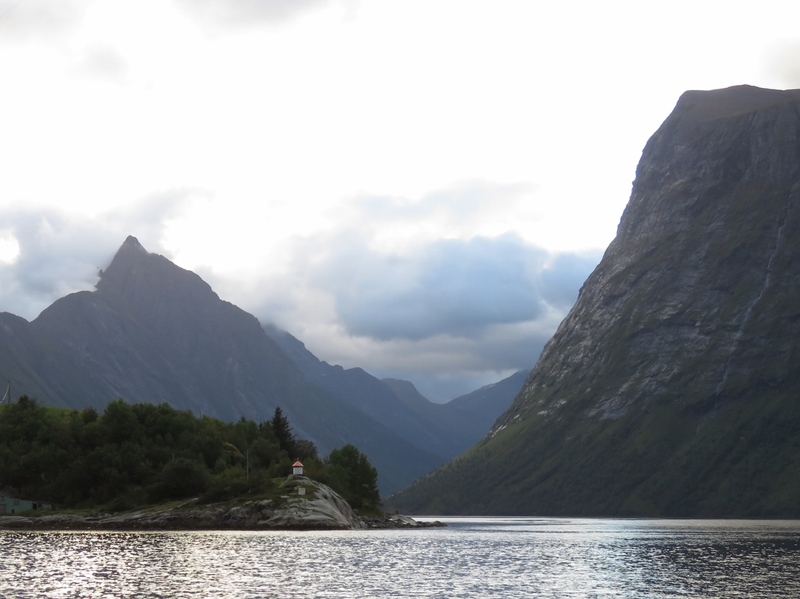 From the anchorage at Honningdalsvagen we made a short, 23nm run to anchor of the village of Oye surrounded by waterfalls and 5,000ft (1,500m) peaks. In the nearly nine since we purchased Dirona, we’ve really wound the hours on our three engines. The main is at 10,016 hours, the gen is just over half of the main engine hours at at 5,515 hours and the wing is 10&percent; of the main engine at 900 hours. In some ways the wing hours are low at only one hundred hours per year, but we’ve seen ten-year-old wing engines with less than fifty hours. Diesel engines like to be used. We departed the anchorage at Honningdalsvagen in the dark and are just starting to get enough light to make out the dramatic craggy peaks at the entrance to Hjorundfjord. 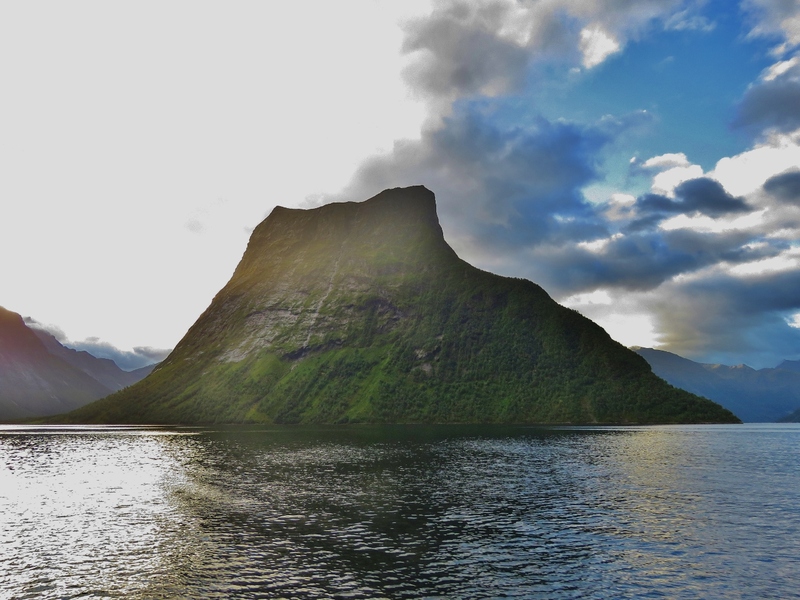 Beautiful scenery as we cruise south through Hjorundfjord. 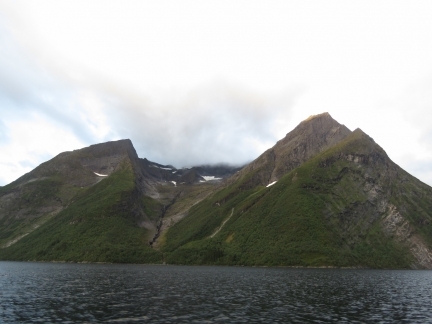 The pyramid-shaped peak of 1564m Slogen visible on the left in the distance as we reach the mouth of Norangsfjorden. We’re planning to hike up it tomorrow—even from here it looks pretty high. The sheer face of 4212-ft (1284m) Stalberghornet lit up in the morning sun. 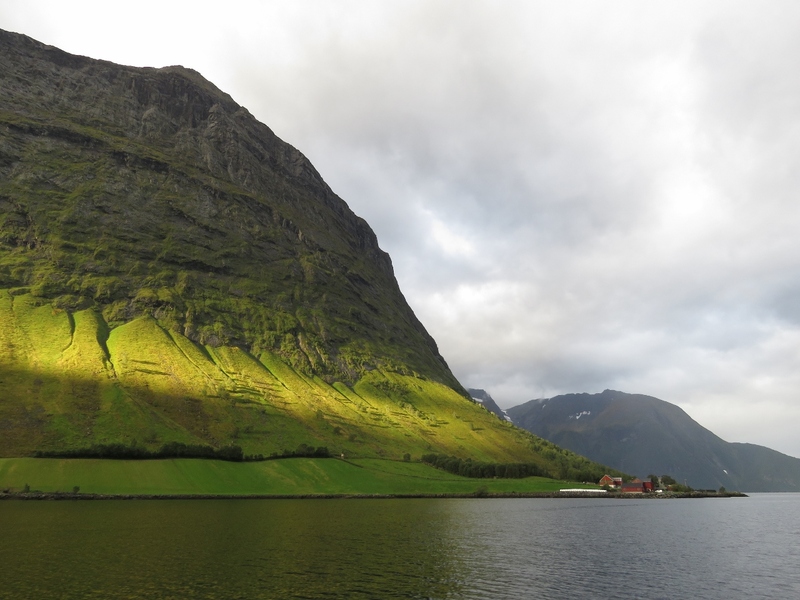 A beam of morning sun lighting up the base of Stalberghornet behind us. 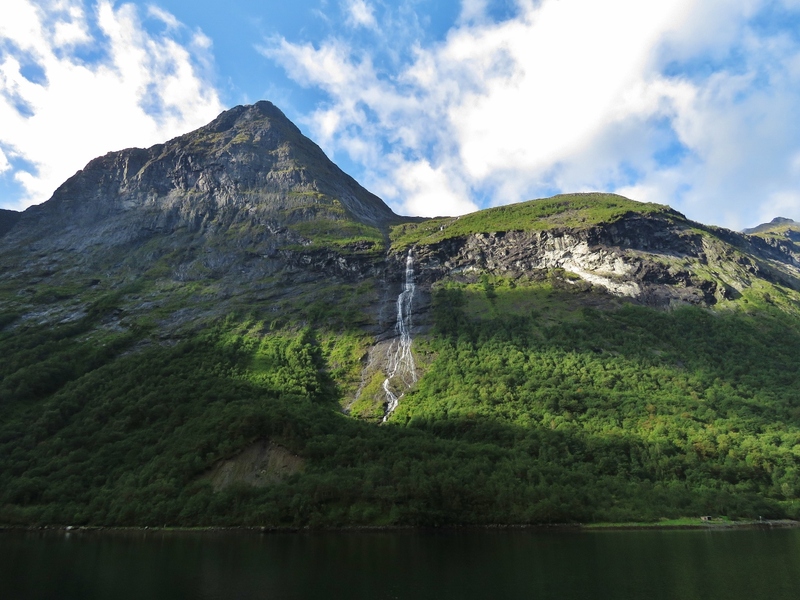 The waterfall Helganeset cascading down a sheer cliff beside us from 2930ft (893m) up. The view to the village of Oye at the head of Norangsfjorden. The anchorage at the head of Norangsfjorden is spectacular, but the holding seemed poor. Our standard approach is to pull back on the anchor at 1,250RPM so we know it can hold in roughly 40 knots of wind, even though it hasn’t had a chance to settle in yet. At Norangsfjorden our usually-reliable Rocna anchor dragged at anything more than idle. We brought it back up and found out why: we’d wrapped the chain around the anchor while setting. We’re normally careful to be backing while we lower chain to avoid this problem, but obviously didn’t get this one right. It’s the first time this has happened, but this is why you really do want to test the set of an anchor. Two days from now, 40-kt gusts are forecast. Had we left the anchor like this, there’s just about a guarantee we would have dragged. 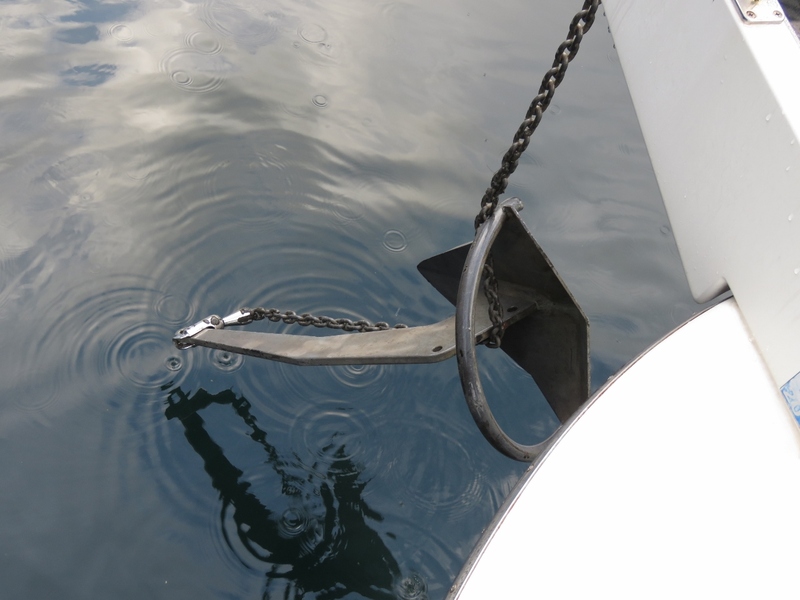 When dropped back in and set properly, the anchor held as well as it usually does. 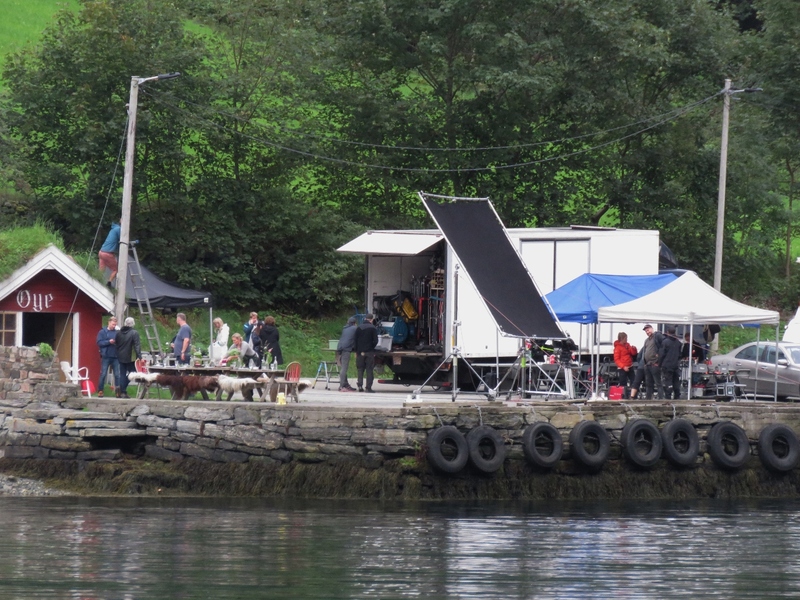 The holding at Norangsfjorden is excellent. 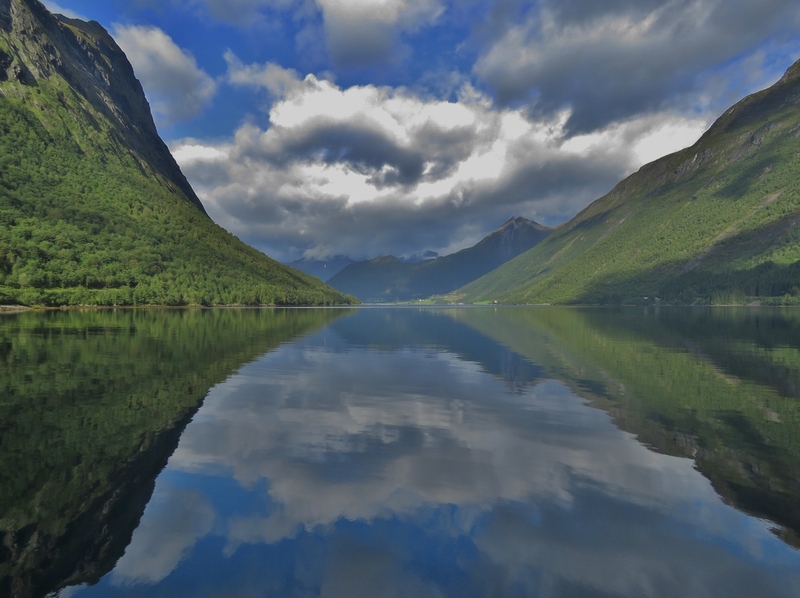 The fabulous view west down Norangsfjorden from our anchorage at the head. 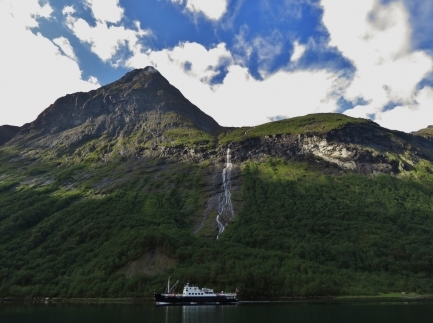 The ferry Bruvik passing under the waterfall Helganeset, on the south side of our anchorage at Norangsfjorden. 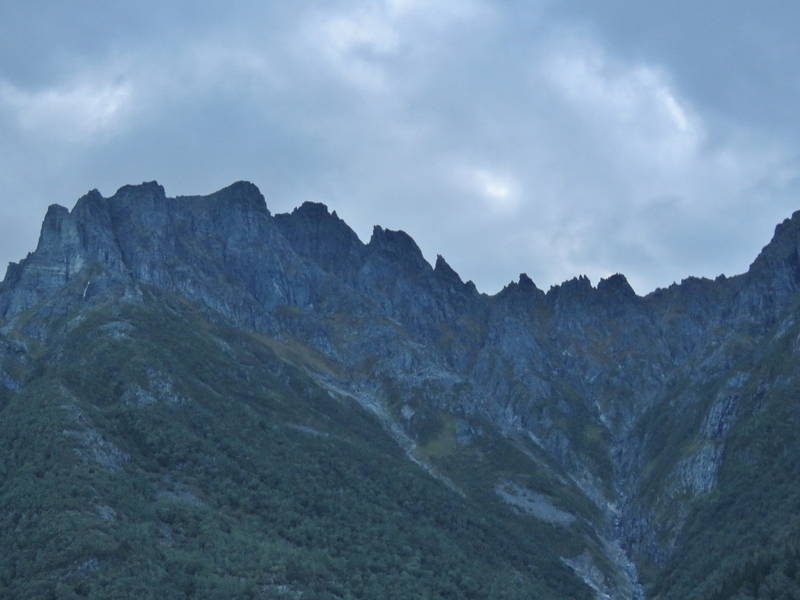 The craggy peaks soaring above the north side of the anchorage. 1546m Slogen is hidden just behind them. On our tender run to Geirangerfjord we purposely ran the tender near dry. 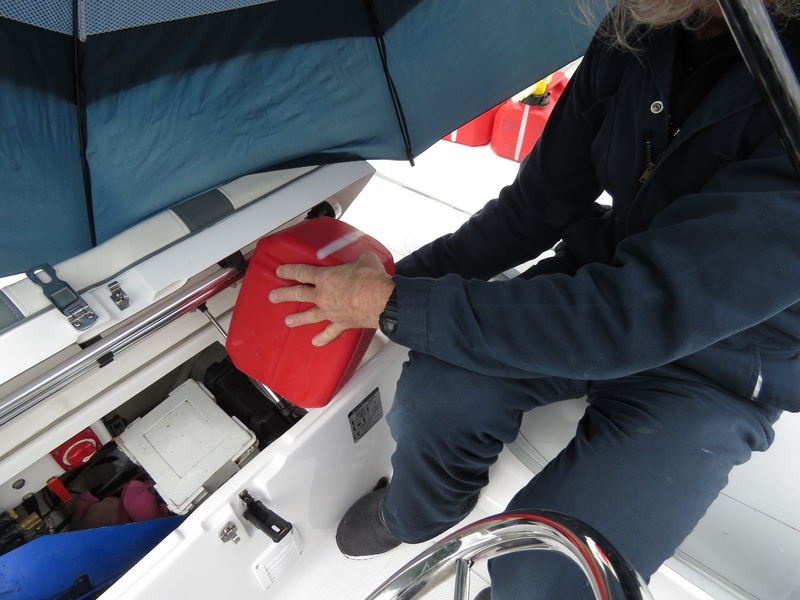 Now we are carefully filling the tank in one-gallon increments to calibrate the new Maretron TLM150 fuel gauge. The tender is listed as having a ten-gallon tank, but the usable capacity from lowest engine pickup to a fully filled tank is 9.2 gallons. Tank capacity is just about never the amount listed in the marketing literature, so it’s always worth checking. James fine-tuning the just-calibrated fuel level, using a laptop to remove unused calibration points. He’s also backing up the Maretron TLM-150 calibration map so, if we change it in the future, we can just load the calibration we just completed. 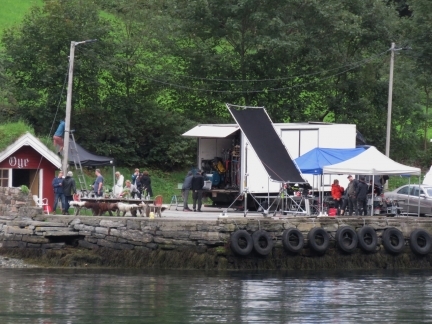 A film crew setting up on shore at the head of Norangsfjorden. How long can you run the main engine before it requires a major overhaul? 10,000 seems like a lot of hours. The short answer is we don’t know. The most common cause of recreational marine engine failure is component failure caused by deferred service, some other issue like rust from inactivity, slowly advancing problems that are not noticed until something big happens, or just plain bad luck in that all parts are not perfectly manufactured. The defense against these failures is good maintenance, keep the engine and bilge clean so you can see problems starting, investigate any change in smell, temperature, leaking, or noise. If the component failure and the lack of use problems are avoided, then it’s only wear that we have to worry about. We check common failure points frequently like accessory drive belts and idler pulley bearings. If there is any change in coolant level or oil levels, we chase them down immediately. Looking at commercial engines, getting up above 20,000 hours on a main engine is normal and some can make it to 30,000. I think 20,000 is probable and 25,000 or beyond is not unlikely. At this point, there is no measurable oil consumption, no change in maximum power output at wide open throttle, no changes in heat or noise, the engine stays nice and clean. 10,000 seems high only because many recreational engines fail in the low thousands of hours due to misuse, disuse, or bad service. 10,000 isn’t anywhere close to high hours for a well built, well maintained, heavy duty diesel. Always enjoy reading your blogs. I’ll probably never get a big boat, regardless of whether I can or not. I think it has to be a passion and don’t know if I’m there yet. I live in NC and first need to find someone, anyone, that has a Nordhavn to get on! Hahaha. 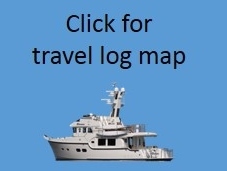 There are many Nordhavn’s near you on the US east coast. Some would be happy to take you out for a ride and many are often looking for crew to help with longer runs. 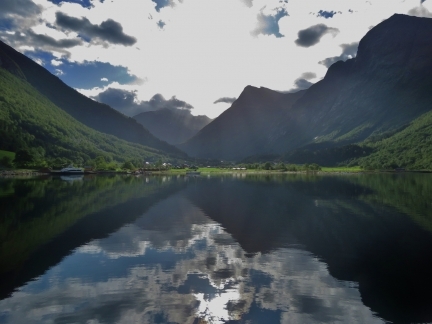 I recommend that you join the Nordhavn Dreamers email group (https://groups.io/g/NordhavnDreamers). Post your interest there and I suspect you’ll get some interest. There are also a couple of Nordhavn’s available for charter including a Nordhavn 52 in Alaska and a Nordhavn 55 on the US east coast: http://www.nordhavn.com/resources/charters/. Hi, I am following your adventures for a while and read that you will winter Dirona in Amsterdam. Just t let you know that on your way from Norway with a little detour you can bunker fuel at +/- 90 euro cent per liter on the German Island Helgoland. Wishing you a save onward journey! 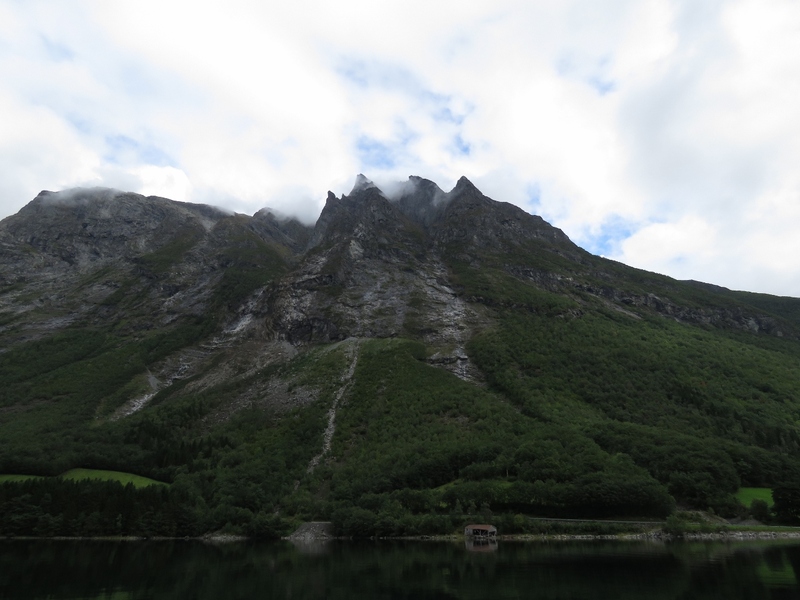 Yes, we fueled there just before entering Norway and it was both convenient and reasonably priced. Thanks for pointing it out.